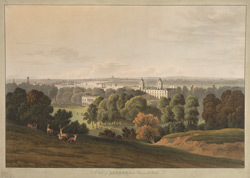 View from the high point in Greenwich Park. From here is one of the best views in London showing not only Greenwich but also the whole City of London beyond. In the picture the square white building at the bottom of the hill is the Queen's House. It was built to a design by Ingio Jones and completed between 1625-40. It was initially intended for Queen Anne of Denmark and after her death for Queen Henrietta Maria. Further down the hill nearer on the riverside is the Royal Naval Hospital, a grand complex started in the late 17th century by Christopher Wren and also worked on by Nicholas Hawksmoor and Vanbrugh. Greenwich was a major port and there are many sailing ships moored on the river.